The Minister of Local Government, Hon. Lits’oane Lits’oane has led a sod turning ceremony for the construction of a footbridge at Seliane Primary School in Shalane, Mohale’s Hoek. Hon. Lits’oane applauded the school for acquiring funding from the American Embassy for construction of the footbridge across Shalane River, which he said will enable pupils to easily cross to and from school during rainy seasons. He called on the Department of Roads Directorate to supervise the work to ensure that it meets required standard to avoid incidences where bridges collapse or are washed away by floods. The Deputy Minister of Education, Hon. Mothepu Mahapa expressed delight about the funding, that he said has turned the school’s dream into a reality. 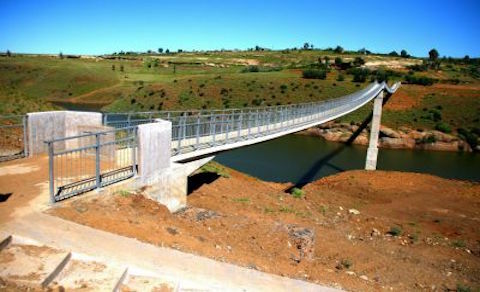 He stated that the footbridge will not only benefit the pupils but the whole community and the church. The Chairperson of the school board, Mr. Kobong Ts’oeu appreciated the development, which he said upon completion will relieve the pupils and teachers who used to suffer and sometimes miss classes during rainy seasons.